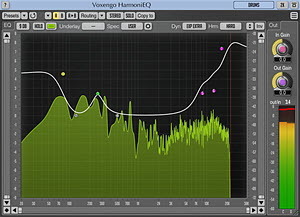 Voxengo HarmoniEQ update version 2.4 is now available for download. Voxengo HarmoniEQ, a parametric, harmonically-enhanced equalizer plug-in for professional music production applications, is available in AAX, AudioUnit, VST and VST3 plug-in formats (including native 64-bit support), for macOS, and Windows computers. - Redesigned the infrastructure controls. - Added equalizer bands coloration. - Added Retina support on macOS, and automatic high-resolution UI size adjustment on Windows. - Added "anti-aliasing" spectrum display mode. - 35% lower CPU usage on AVX2-capable processors (in 64-bit mode).